This past summer my sixteen–year-old daughter chose to study Spanish abroad. She had been studying Spanish since middle school and realized that in order to achieve a true level of fluency, she needed to immerse herself in an all-Spanish speaking environment. A representative from Sol Abroad had visited her high school, and she was sold on participating in one of their programs. She liked the fact that Sol Abroad runs programs only for Spanish language learners. Several upper classman from her school had gone on Sol Abroad trips the previous summer, with positive experiences and improved language skills. Sol Abroad runs programs in four countries, Spain, Argentina, Mexico and Costa Rica. All locations combine a home stay with formalized language instruction and include weekend trips for the entire group of teens, where you get to know the country that you are studying in. Madeleine chose to study in Costa Rica for three weeks. She was curious to explore the flora and fauna that she had heard was so unique to this country, and I liked the fact that there was a non-stop flight from our home in New York, as this was to be her first time travelling alone. Her 3-week program was located in Atenas, a small town near the capitol, San Jose. A few weeks before her departure, we were notified that her host family consisted of Mom, Dad, a teenaged son, and two young daughters. Madeleine seemed pleased with her placement, as she had filled out an extensive questionnaire regarding her host family preferences, and as she loves younger kids, she felt that her voice had been heard. She was nervous about her how she would like living in a family of strangers, but this turned out to be the most rewarding and enriching part of her trip. She adored her family, and felt instantly welcomed and part of the flock. She was included in the extended family circle as well, as she was invited to come along and visit cousins, grandparents and aunts of her host family. This gave her a unique window to see several different local families’ lifestyles. She loved spending time with her two younger “sisters”, and especially liked dropping them off at their school in the morning, as she walked to school herself. Her host Mother, Maribel was so motherly and protective that she hardly missed my maternal presence. Maribel was also a fantastic cook, and Madeleine loved the Tico Cuisine. Each Monday-Friday, Sol Abroad students spend the morning at a local language school. Madeleine was in the most advanced group, and got a lot of personalized attention, as her group numbered only three students. The school organized service projects in a local school, which allowed her to practice her Spanish and teach English to neighborhood children, further increasing her contact with locals. She was thrilled to be invited out to see an evening of live theater with the school’s elegant and cultivated director on one of her final evenings in town. Although the two chaperoned weekend trips to the rainforest and to a remote beach were the things she was most looking forward to, in reality they were her least favorite part of her journey. She didn’t much like being in a group of American kids, preferring the authentic experience that she had living with her host family. She found the destinations strikingly scenic, but didn’t much like being part of a group of youthful tourists. From a parent’s perspective, I found the on-site staff helpful and concerned. After the first weekend trip, Madeleine wrote and told me that she did not want to go on the next weekend trip, preferring to stay “home” with her host family. She felt out of the general loop of the other kids’ social dynamic. She didn’t think the other kids were there to focus on learning the local culture, but rather just to have fun. She also was disheartened that the kids themselves picked roommates for the overnight trip, and felt left out. I sent an e-mail to Placido, the on-site program director, explaining her feelings, but also expressing my own preference that she go on the rainforest trip, a once-in-a-lifetime experience. Placido was very available to me, and asked for my insight into my child’s feelings. 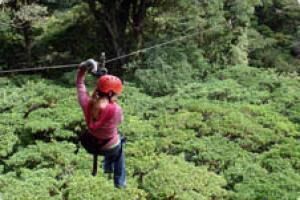 With his help, Madeleine was encouraged to attend the rainforest excursion, and ended up enjoying it immensely, the canopy tour in particular. She was assured that the staff would make the roommate selections this time, and she felt supported enough to give it a try. The staff was wonderful about sending e-mails, keeping parents up to date about how the kids were doing. There was even a blog, updated daily, with photos of the kids engaged in their daily lives and activities. Parents of teenagers will appreciate and be reassured with the thorough and consistent communication that the program provides. Thanks so much for this interesting article. My son is 14 and we are looking into a spanish immersion for him this summer, so this is really useful for us. We live in the western part of the U.S., so Costa Rica makes sense for him. Thanks again.